Day number 2 is represented by Ehecatl’s head, Lord of the Winds. It is the Divine Breath, the vital principle, the power of the Creative WORD, showing us the care we must employ when making use of the verb. Ehecatl represents the God of Winds, movement, breath and life. Just as the wind carries the seeds that fertilize Mother Earth, just like breath enlivens the body and the seed of humankind leads to creation. Ruling God:	Related to culture, soul, art and spirit. Those born on this day are considered to have a tendency towards esotericism and Jinn science. 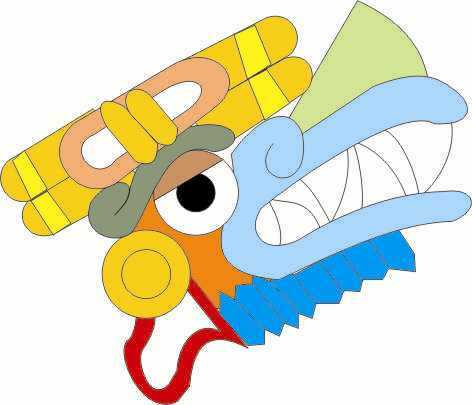 This second sign is ruled by Quetzalcoatl: creator of men, God-Priest. It also shows the ocelocopilli, the conical hat made from the skin of the tiger. The Location of the Day in the Borgia Codex: Located at its Maxtatl (loincloth) and moving towards the rear, representing the need to abandon all theories, all which is temporal.